So EPI and I went and checked out the volcanic eruption on Friday evening. We decided to take a tour rather than drive up there ourselves, and chose to travel with Reykjavík Excursions since they were the first company that came to mind. The bus left at 6 pm from Reykjavík – I probably would not have had the wherewithal to leave at that time of day but, on reflection, it made perfect sense because we got such a fantastic view of the eruption in the dark. Much better than daytime, I would imagine. A guide provided lots of fascinating info en route – in English – about volcanoes and suchlike. Fascinating even for natives like EPI and myself, who didn’t even know half of what he told us about volcanic activity on our fair isle. The drive took about an hour and 15 minutes to Hvolsvöllur, a small town in the southeast, where we stopped for half an hour. That, in fact, is about the only thing I can fault on the whole tour – I thought that stop was a bit too long, and heard other passengers complaining about it, too. I imagine it was intended to allow people to grab a bite to eat, since it was dinnertime, but I didn’t see anyone doing so and people were getting a bit impatient to get a move on, particularly since some of us wanted to take pictures but didn’t have a tripod, and it was getting pretty dark. Anyway, after that fairly extended stop we got back on the bus and headed north, into Fljótshlíð, one of the most beautiful and historic places in Iceland [as the Saga aficianados will know]. We drove along until the asphalt turned to gravel, at which point it got a little hairy because there was SO MUCH TRAFFIC – seriously, it was like Laugavegur on a Saturday night. It seemed like everyone and their dog had made the trip to check out the spectacle, and when Big Coach met Little Compact [yes, there were some of those] … well, let’s just say I wouldn’t have wanted to be in that little compact on that narrow gravel road. We got a glimpse of the fire from the eruption fairly soon after turning onto the road to Fljótshlíð and moved progressively closer. At some point it veered off to the right [the road that went straight on had been closed] and parked in a sort of makeshift parking lot. It was fairly chaotic there, loads of vehicles, since you couldn’t get any further unless you were in a 4WD on account of the rivers that needed to be crossed. But of course there were tons of 4WDs doing just that and a steady stream of headlights coming at us in the darkness, which kind of detracted from the vision of the volcano because they were pretty much right in our face. EPI and I found the perfect solution, though: by crouching behind a small ridge you could block out the lights and just look up at the eruption. It was far away – probably around five kilometres; of course the tour operator kept a safe distance and went no closer than advised by Civil Defence [a man I spoke to at the RE office, however, said they were waiting for a permit to go a bit closer, which might already have been granted by now]. Yet even at such a distance it was amazing. Just being there and viewing it with our own eyes was incredible. And in those surroundings, with the gorgeous Eyjafjallajökull glacier off to the side … so awesome! As I said, it was dark and we had no tripod, so we only managed to get one decent picture, by placing the camera on top of someone’s car. The eruption appears to be in two different places, but if I understood the guide correctly, the place on the left is the reflection of the lava falling down in a spectacular “lava waterfall” [you can see an amazing pictures of this here, along with other spectacular pictures of the eruption]. On the right, however, there was plenty of activity. The fire kept flaring up against the dark night sky, shifting and changing, and was completely hypnotic to watch. So beautiful and otherworldly. I could have sat there all night just gazing at it. EPI and I had made sure we were properly dressed, knowing it would be COLD up there. Even so, we could only manage a few minutes outdoors, as the wind was absolutely freezing, and burned [yes!] any exposed skin. Others on the tour were not so well outfitted, hence it was great to be able to go back inside the bus and look out at the eruption from there. We’d taken along some sandwiches [flatkökur with smoked lamb] and some hot tea, so we munched on that while looking out. Happily the bus driver turned off all the lights inside the bus so the view was perfect. We stayed at the eruption site for about an hour. I thought the guide and bus driver were really cool – they actually asked people if they were ready to go or if they’d like to stay longer, but everyone had seen plenty by that time. We got back to town around 12.30 am — the bus dropped everyone off at their respective hotel which I thought was pretty cool. Definitely the experience of a lifetime. If you’re in Iceland and get a chance to see the eruption, I’d highly recommend that you go for it. The only thing we really missed having, and which we forgot to take, was binoculars. Be ye not so, er, forgetful. The surprisingly constant good weather conditions in this area over the last days might belie the fact that the weather up there is usually some of the most unpredictable in Iceland. Myself, I started twice for hiking tours on a perfect sunny morning from Thorsmörk up to Fimmvörðuháls and was met there by fog with zero visibility once and a heavy thunderstorm with torrential rain another time (I wasn’t even aware then, that this kind of thunderstorm ever happens in Iceland). So, hopefully, nobody is getting in trouble on such a hike up to the volcano. The best time for taking pictures and viewing the scenery on webcam seems to be at twilight, when the landmarks are still discernable and the reflections of the lava are most impressive. How did you dress for the outing? I’m trying to figure out what I need to take with me if the volcano is still going on April 15. Great photo! I’d love to get there to see it for myself! Thanks for sharing! Today I decided to book a trip to Iceland (from Germany) over the easter holidays and decided for the super jeep tour with the helicopter flight next Saturday. Now I have everything booked. I just hope that a) the weather will be acceptable (so that the view is good and we can actually do the helicopter tour) and b) that the volcano keeps going till then. Thanks to your report I won’t be missing a tripod (need to buy one before I leave) or binoculars. I’m totally excited – both about the volcano and about traveling to Iceland again in general. Believe it or not, there were people on the tour who were wearing light jackets and sneakers. JH — nice one! Sounds great. I’d love to do the helicopter tour, myself. Let me guess…those must have been (foreign) tourists. But there have been a couple of reports about poorly equipped people trying to get close to the volcano. Well, she most likely wants to keep the suitors to a bare minimum. I mean, you might be able to see a tiny patch of skin. I know I had to restrain the urge to swoon just reading about it. That was a great photograph and would make a great painting. I wondered if the earth was groaning too and what that must sound like! we went a night or two earlier and it was the most gorgeous still perfect night, not even cold at all, there were even some faint northern lights milling about which was a nice bonus. This freezing wind has just come in recently. It was an awesome site, but left me badly wanting to hike in and get a proper look, does anyone know what path one needs to take to see this lava ‘waterfall’? Fantastic ! I really am going to get over for this. Any recommendations for super jeep tours ? I won’t even mention the ‘i’ word. Nice change of pace, with a volcano a lovely topic for the weather report. This, in a round-about way, is why I’ve so enjoyed my visits to Iceland. Just imagine you were looking at this same scene, fire and ice and smoke and liquid, molten rock, but not in 2010, but in 1610, or maybe 910 AD. WTF indeed! I recall 20 years ago, standing at the famous Geysir, seeing stream and boiling water shoot up from the ground, and it was just so easy to imagine early people stumbling across the vast, barren landscape, coming acr0ss this sight, and just totally being blown away. Who else but the Gods could produce this magic, this miracle? I’ve been lucky to have been to a lot of places in the world, but these places and these moments are right up at the top of the list, the things I remember most. Wow. Amazing. And lucky that the volcano is in such a remote place you don’t have a major natural disaster on your hands. * What an opportunity to be able to see something like that firsthand. Thanks for sharing the experience. *Mt. Hood is a volcano (just like Mt. St. Helen) and if it blows, Portland a number of other communities are in BIG trouble. As I’m looking at these awesome photos and reading the comments I wondering about the Northern Lights. What a great photo that would be with this eruption and the Aurora Borealis in the sky. All that colour in motion would be a fantastic experience. Those of you who get to experience it are so blessed. Life is good! I don’t think that there is a general save route to the lava falls. Many pictures seem to be taken from Mórinsheiði but the route up there, starting from Basar in Thorsmörk, has apparently been closed down, at least temporarily. So, it should be the best thing to turn to the authorities to get the latest information about the conditions, particularly with respect to shifting winds and moving lava flows. I think, the lava fall in the picture Alda linked to was taken at an early time, when the lava was first flowing down Hrunagil east of Mórinsheiði, while later the lava was going down through Hvannagil. And I understand that the situation might have changed again. I would most likely take a superjeep tour, if I just had the chance. I agree with you – its absolutely fantastic. And the traffic is just mad – I haven’t seen so many small cars (Nissan Micra or Toyota Yaris) crossing through 30cm deep water. And going back in the dark. Thats completely insane – and its probably just a matter of time, until somebody gets hurt. Joerg, thanks for the information, much appreciated. I can really recommend doing a superjeep tour. I could participate in one and its really, really amazing. Another thumbs up for getting out in a superjeep here. (I’ve done five or six with a company with the word in the URL). Unless you are a pro driver, they’re the only way you’re going to get to some of the remoter places in Iceland. Great photo Alda – I am seriously jealous of you. Is this your first volcanic eruption close-up? 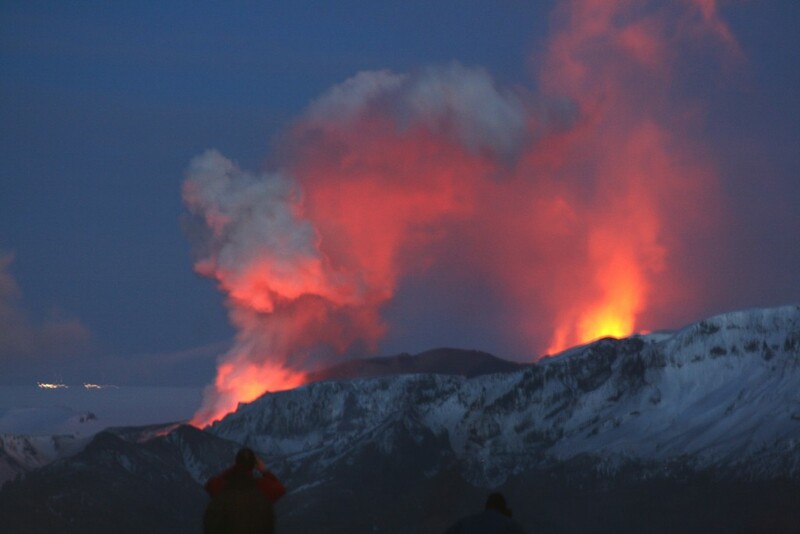 When I spoke to most Icelanders they looked pityingly at me when I said I hadn’t seen a volcano erupt. And could you hear it? If so – what was it like? Previous post: Ta ta strip clubs!